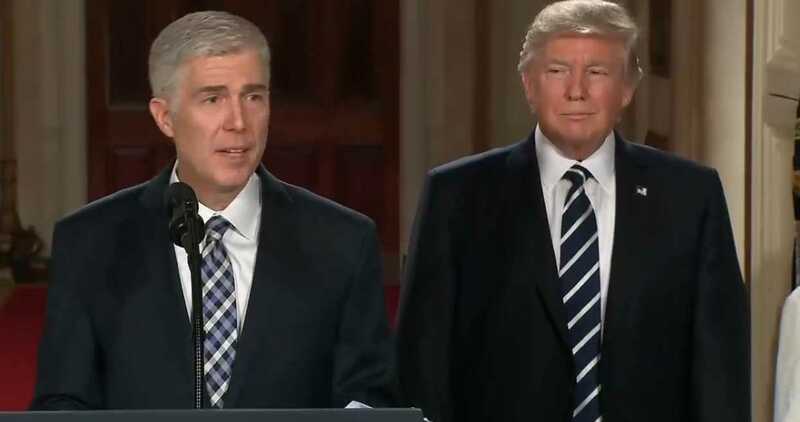 President Trump has announced that he has nominated 10th Circuit Court of Appeals Judge Neil Gorsuch to serve on the U.S. Supreme Court as the replacement for the late Justice Antonin Scalia. “Judge Gorsuch has outstanding legal skills, a brilliant mind, tremendous discipline and has earned bipartisan support,” Trump stated in introducing his pick to the public Tuesday night. “Mr. President, I am honored and I am humbled. Thank you very much,” Gorsuch, an Episcopalian, said to applause in accepting the nomination. Gorsuch, now 49, had been nominated to the 10th Circuit in 2006 by then-President George W. Bush. He was a graduate of Harvard Law School and has a PhD. from Oxford. He served as a clerk under current Justice Anthony Kennedy. Gorsuch is known for ruling in favor of the popular craft chain Hobby Lobby, which had sued the Obama administration over its abortion pill mandate. The company had sued to retain the right not to cover contraceptives that it considers to be abortifacients, such as the morning-after pill. Gorsuch pointed to the federal Religious Freedom Restoration Act in his ruling. But Ed Whelan, who disagrees with both of Schlafly’s assertions, notes for the National Review that Gorsuch had dissented from the majority opinion when his colleagues ruled in Planned Parenthood Association of Utah v. Herbert that that state of Utah could not defund the abortion giant Planned Parenthood. “Respectfully, the panel in this case not only conducted its own de novo review of the record, it relaxed PPAU’s burden of proof and even seemed to reverse it,” Gorsuch wrote. Gorsuch has also seemed to indicate that he believes the government should be permitted to erect religious displays on public property, disagreeing with his colleagues who rejected a rehearing in the 2007 case of Pleasant Grove City v. Summum, which involved a Ten Commandments display. Gorsuch is stated by others as being much like Scalia, including being an “originalist,” that is, seeking to interpret the Constitution in the “original intent” of the Founding Fathers. He cited the high court justice in his acceptance speech as Scalia’s wife sat in the audience. In an article for the Case Western Reserve Law Review, Gorsuch recalled being overcome with sorrow upon hearing of Scalia’s death. He had been taking a skiing trip when his phone rang with the news. “I immediately lost what breath I had left, and I am not embarrassed to admit that I couldn’t see the rest of the way down the mountain for the tears,” Gorsuch wrote. As previously reported, Trump had outlined even before the election that he intended on appointing a Supreme Court justice like the late Antonin Scalia. He also noted that religion has very little to do with his decisions. As previously reported, Trump originally had 21 judges on his Supreme Court list, with Judges William Pryor, Thomas Hardiman and Gorsuch stated to be on his shortlist. Pryor was especially controversial as he had prosecuted “Ten Commandments Judge” Roy Moore and had vowed to uphold Roe v. Wade while serving in the 11th Circuit. Trump advisor Leonard Leo is stated to have helped the president with narrowing down the list and making a selection.